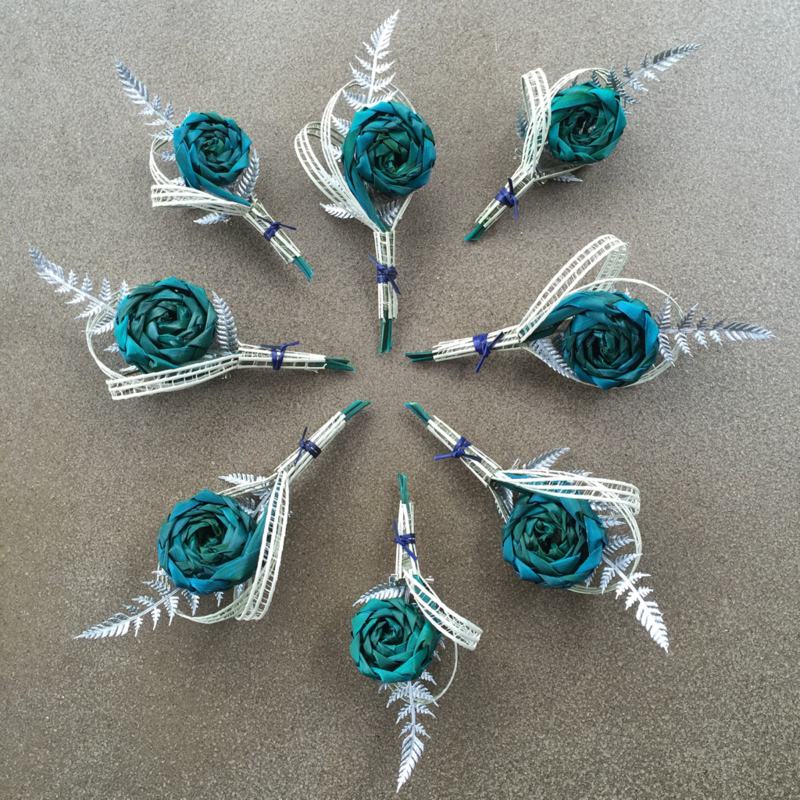 Classic buttonhole with loops & silver fern $20 NZD. Showing coral flower above & ice blue below. 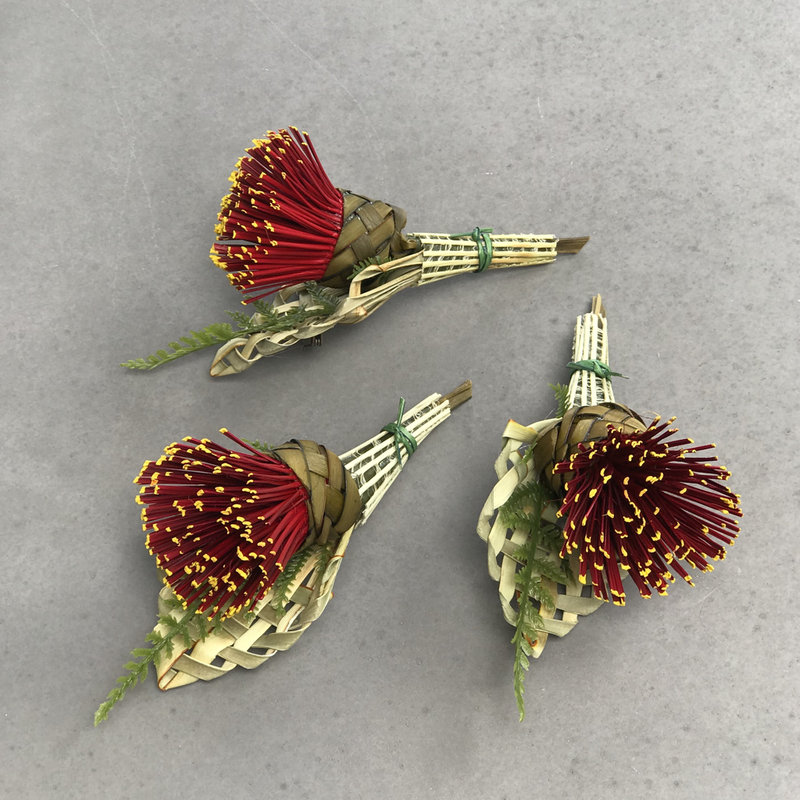 Three bud corsage $25 NZD and single bud corsages $20 NZD each. 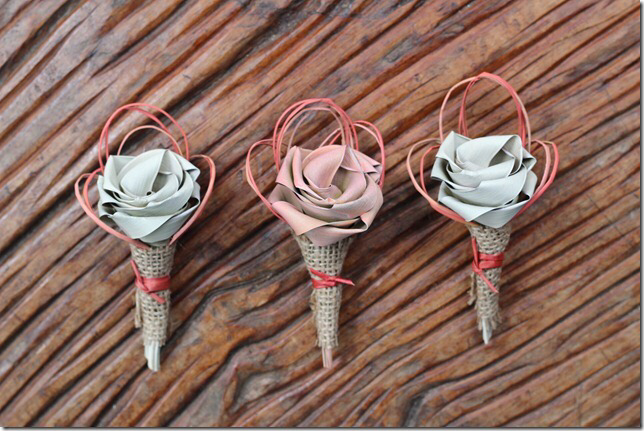 Shown here in coral, lavender & pink with imitation green fern and natural loops. 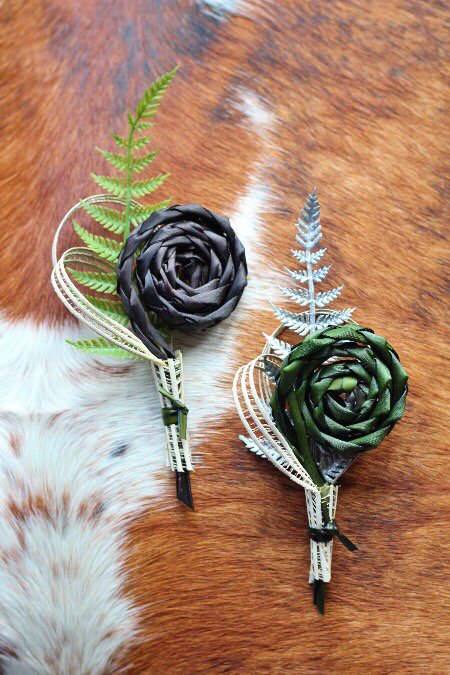 Fan style buttonhole with silver fern & koru $20 NZD. 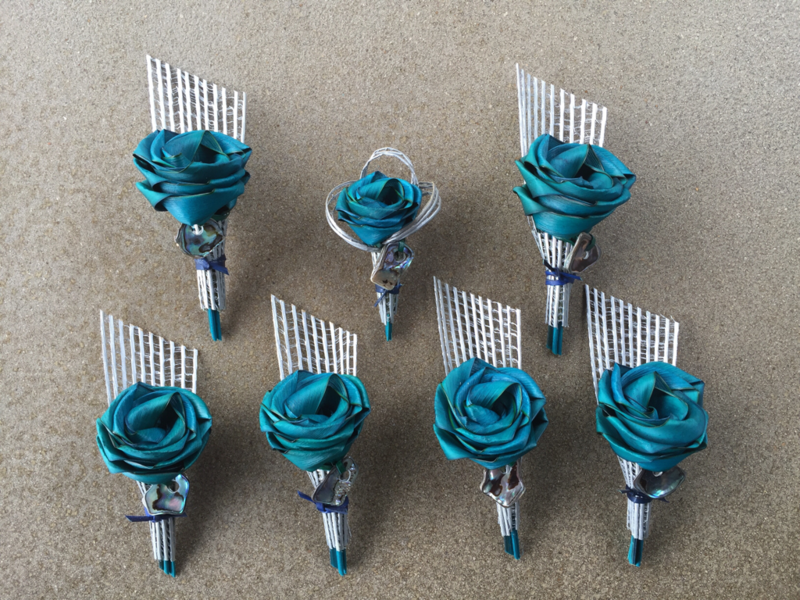 Turquoise & silver fan Paua buttonholes $20 NZD. 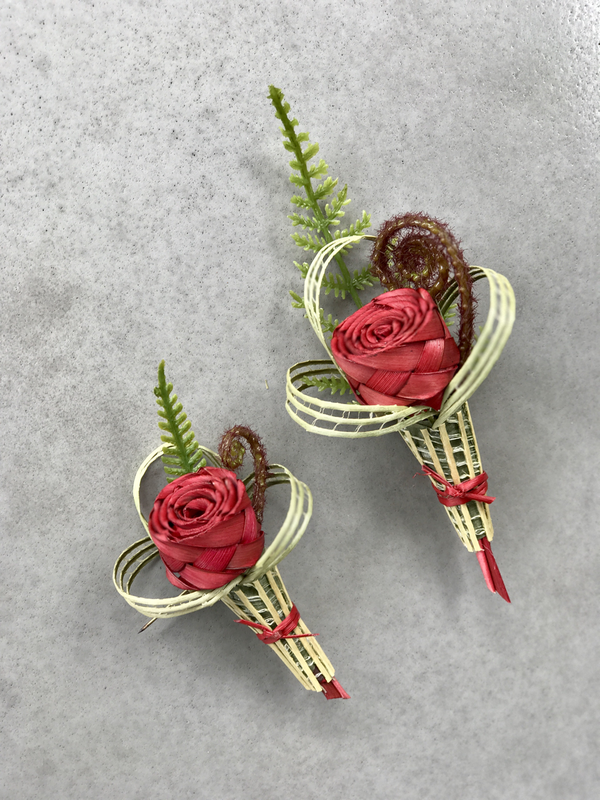 Single bud buttonholes shown here in two sizes with fern, koru & natural loops. 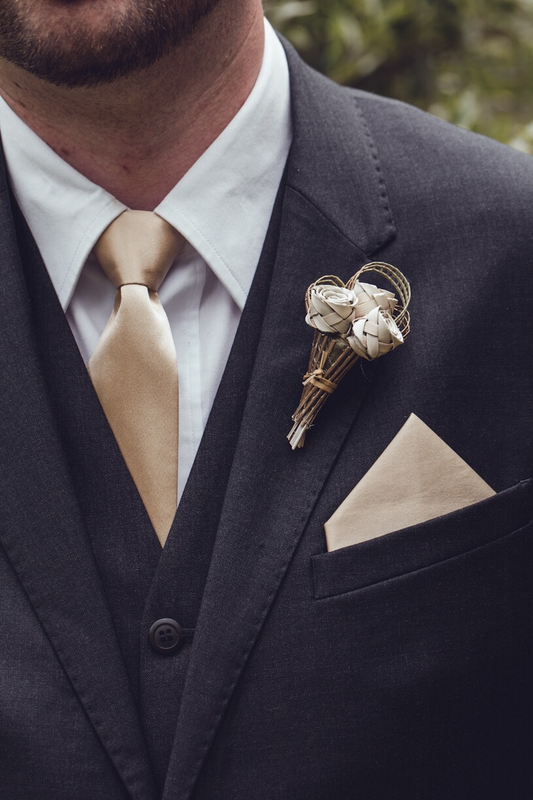 Mini size for the pageboy & large for the groom $20 NZD each. 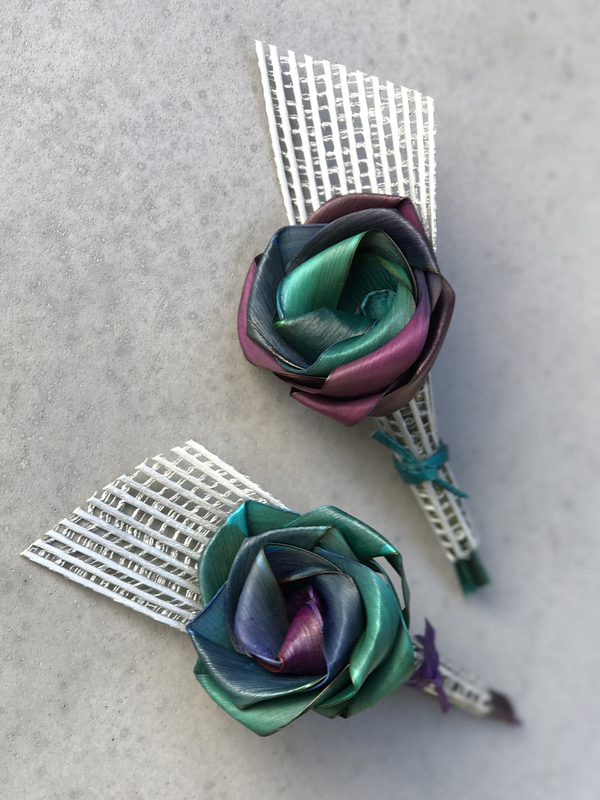 Multi coloured paua buttonholes $25 NZD. 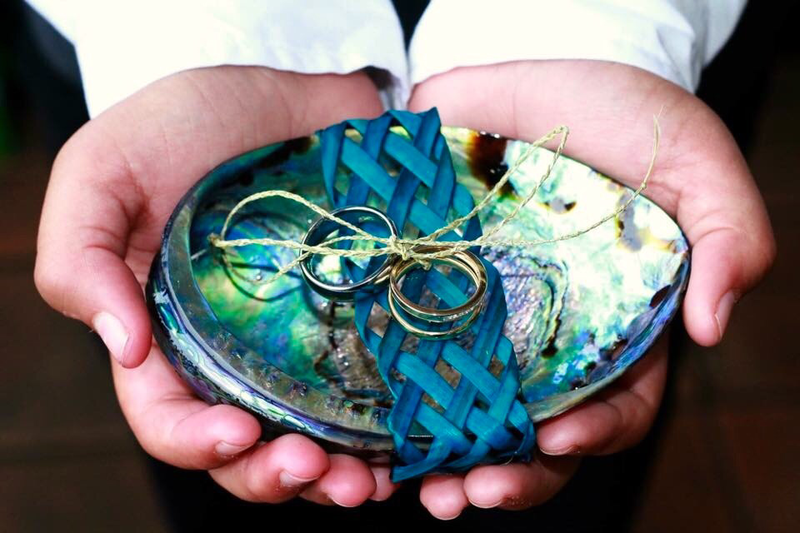 Turquoise woven Koru with silver fern & loops $25 NZD. 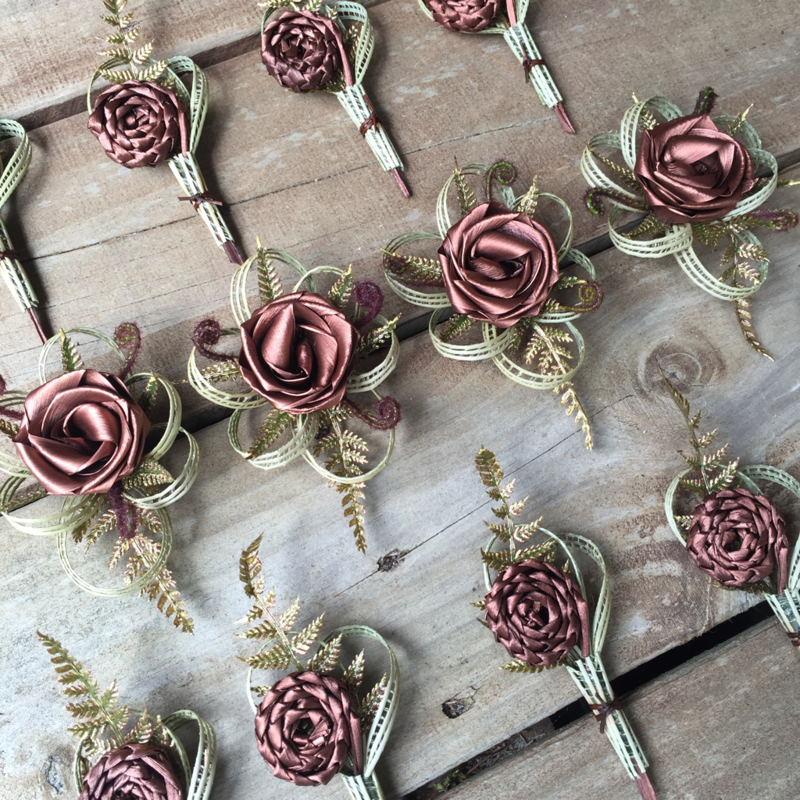 Peacock buttonholes $25 NZD. 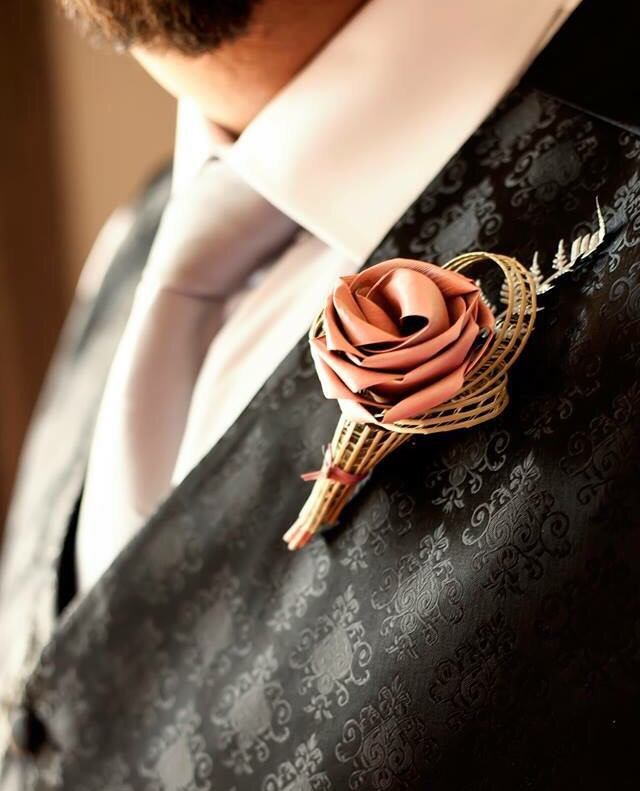 This images shows the broach pin attached to all of our buttonholes & corsages for easy application. 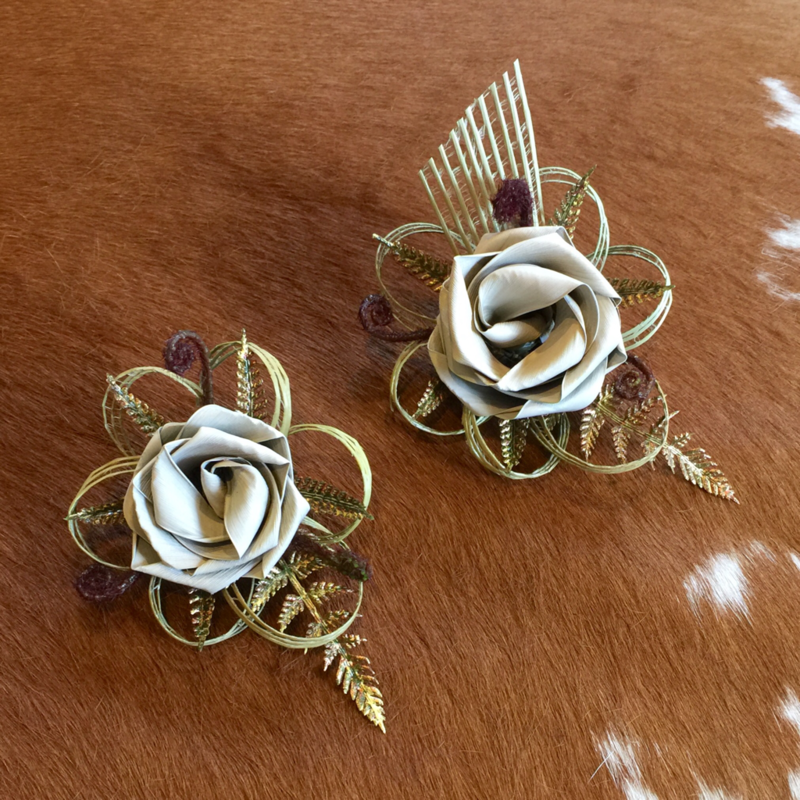 Three bud buttonhole in ivory & gold $25 NZD. 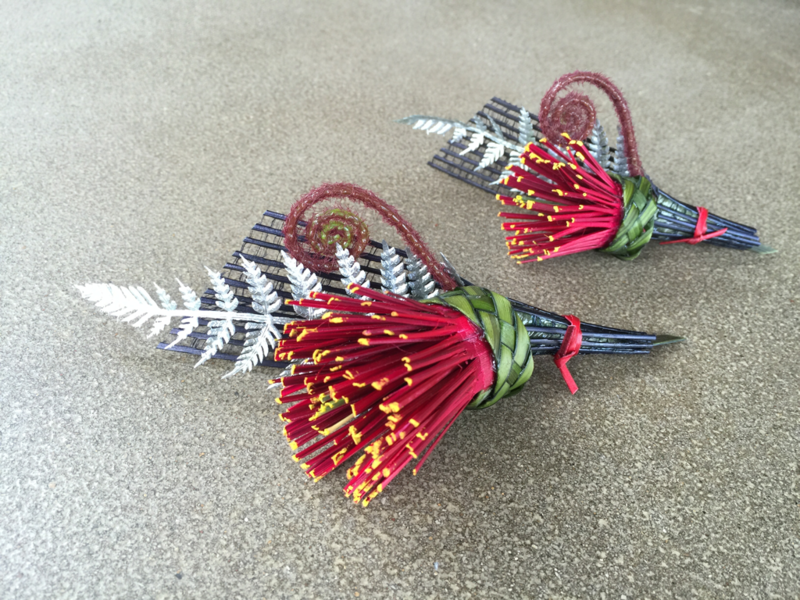 Pohutukawa buttonholes with black fan, koru & silver fern $25 NZD. 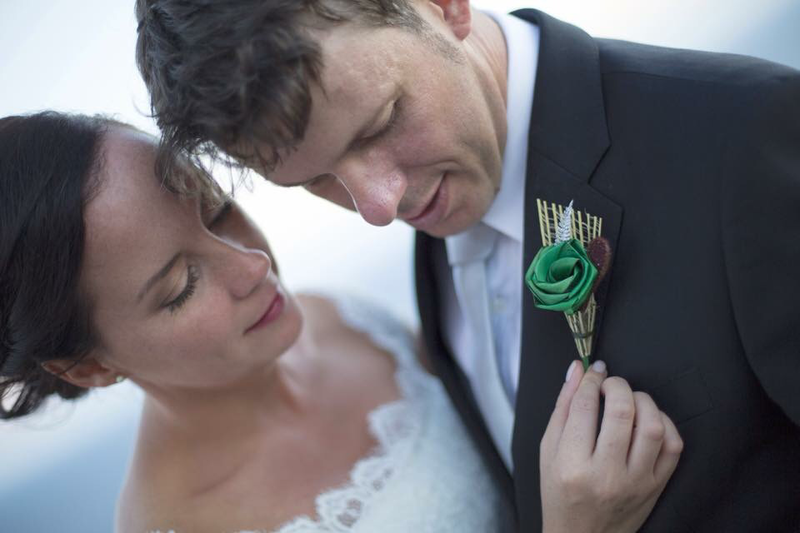 Dark brown & sage green woven koru buttonholes with fern & loops $25 NZD. 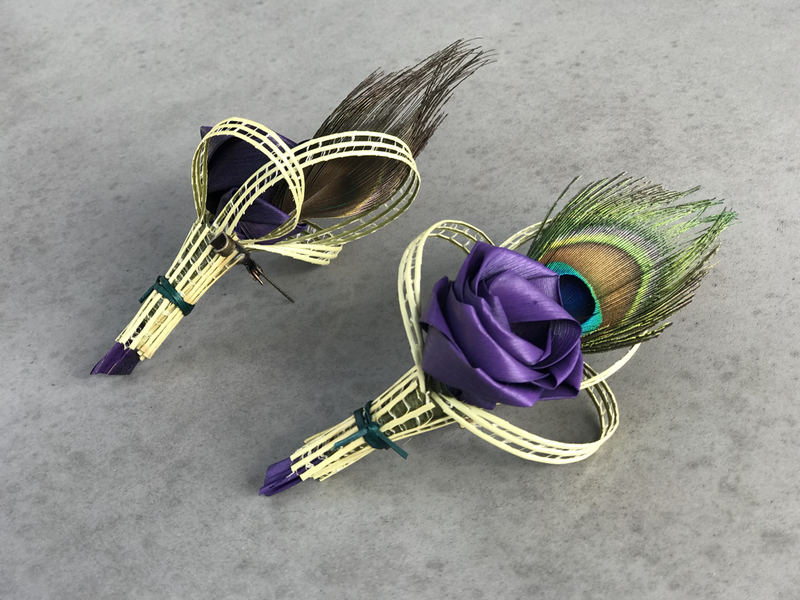 The 'Tui' buttonhole with woven fan backing, fern & koru $25 NZD each. 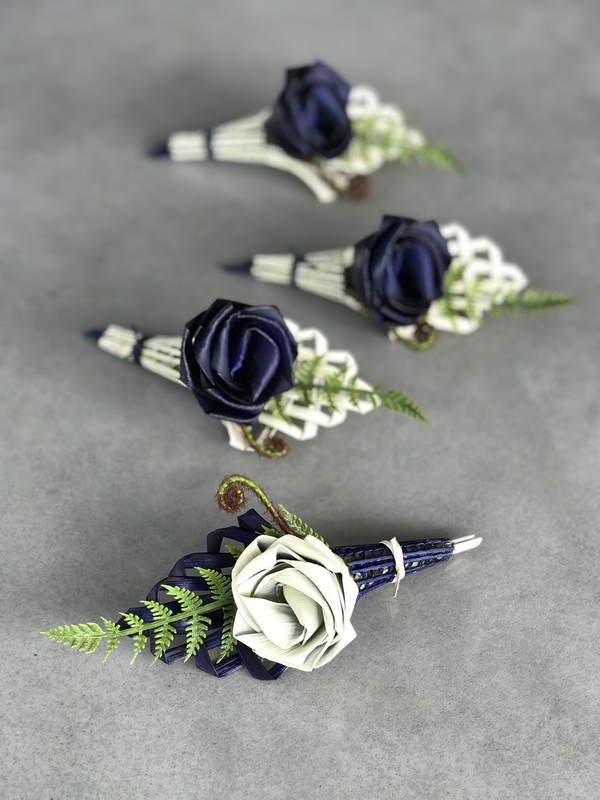 Blue & white Tui buttonholes. 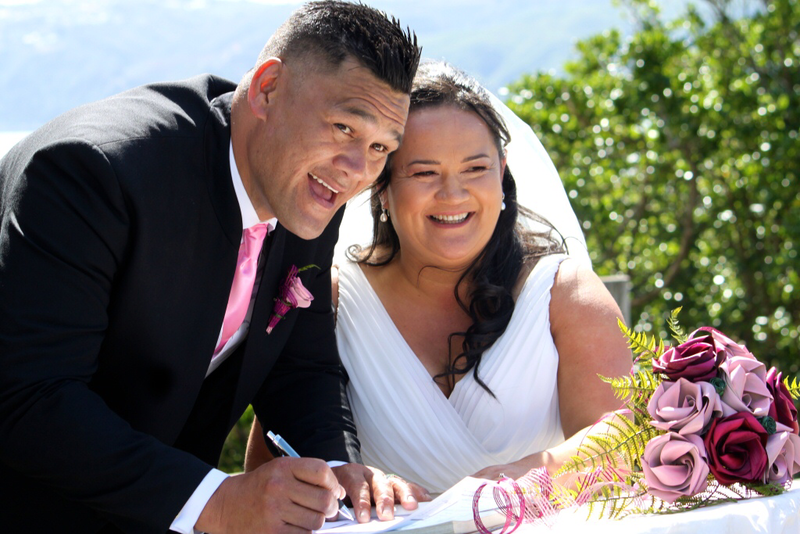 Any of our designs can be created in your wedding colours. 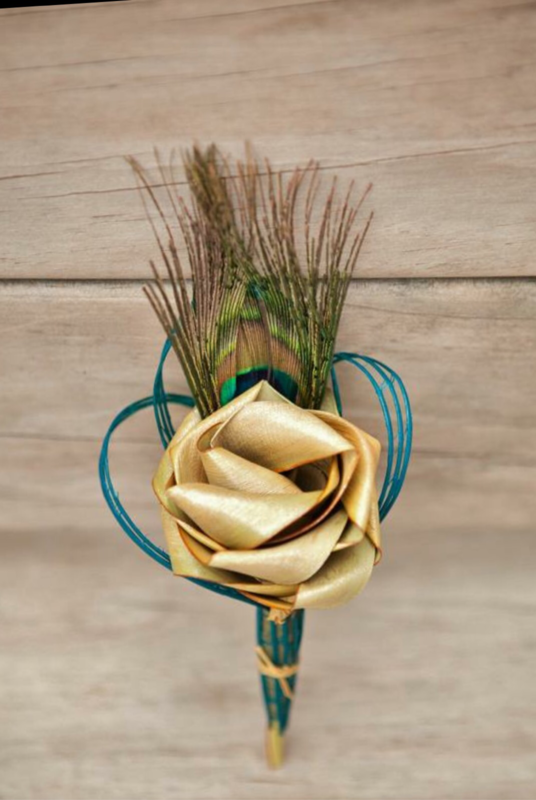 Rustic buttonholes with grasses & hessian wrap $20 NZD. 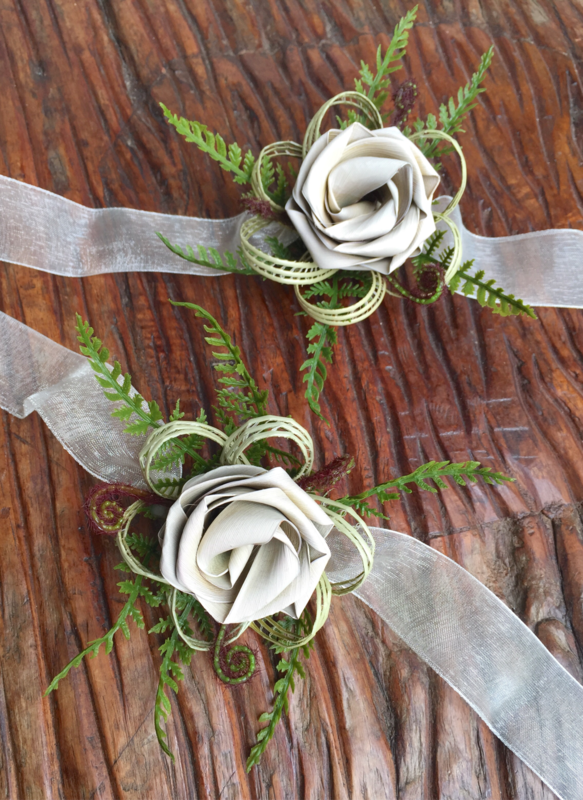 Ivory rose with natural loops & green fern $20 NZD. 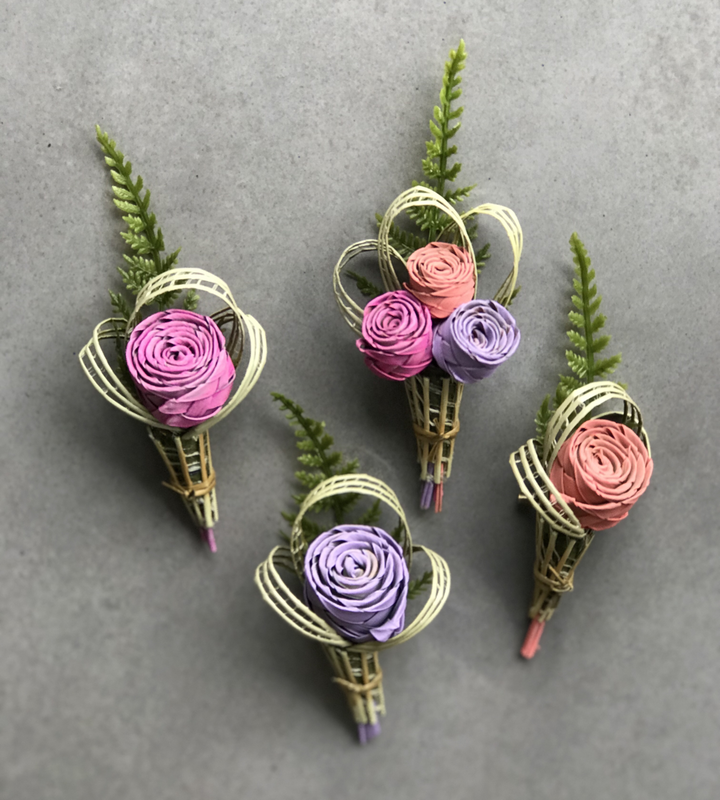 These are popular with the parents as a neutral colour choice. 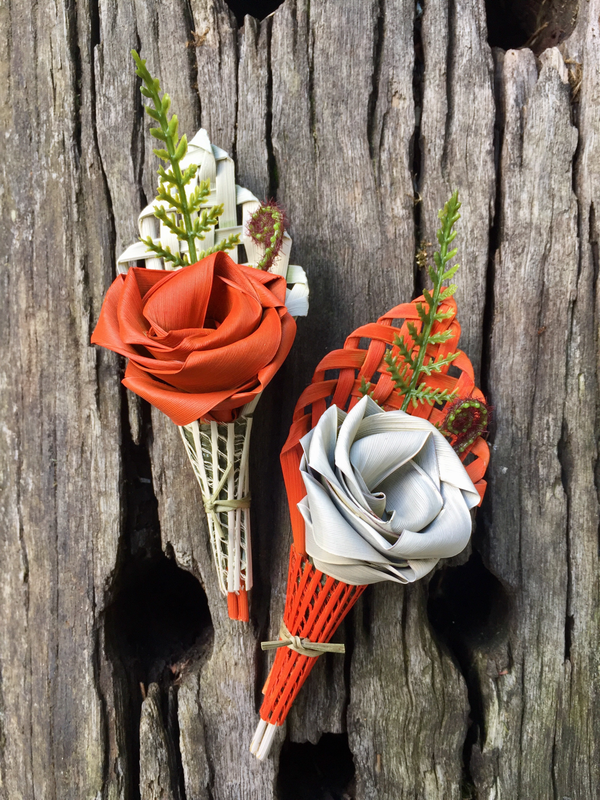 Wrist corsages in Ivory with large ferns & koru $35 NZD each. 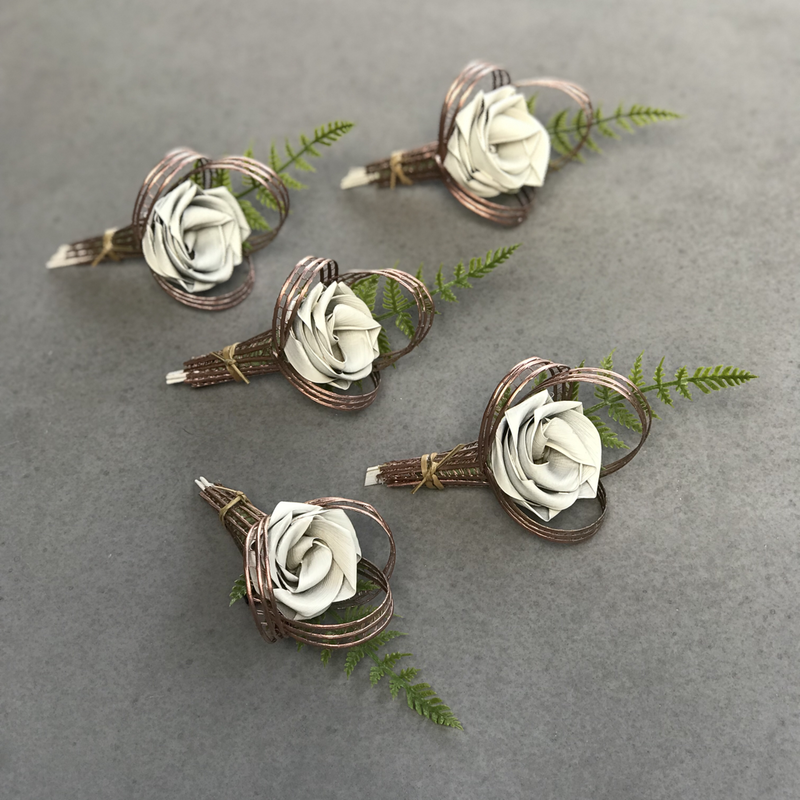 Teardrop corsages in ivory featuring rose gold loops & green fern $25 NZD each. 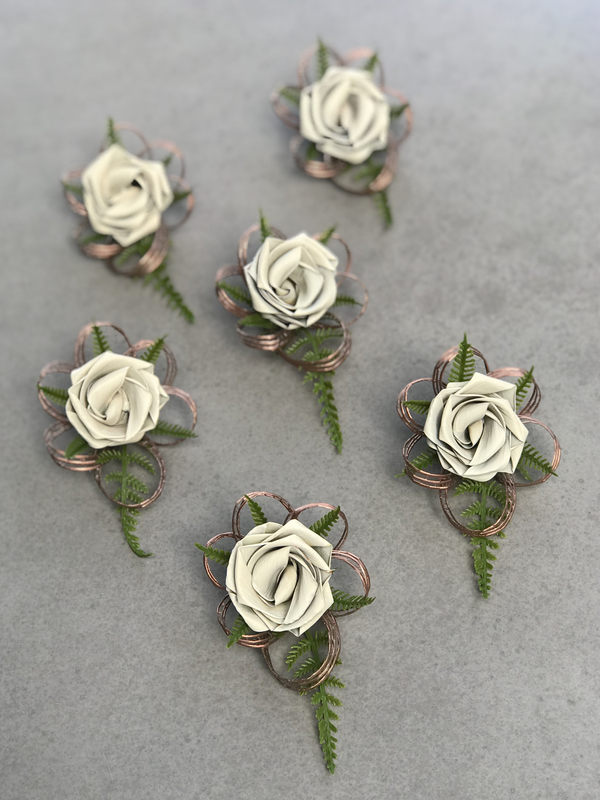 Buttonholes in ivory with rose gold loops and green fern. $20 NZD each. 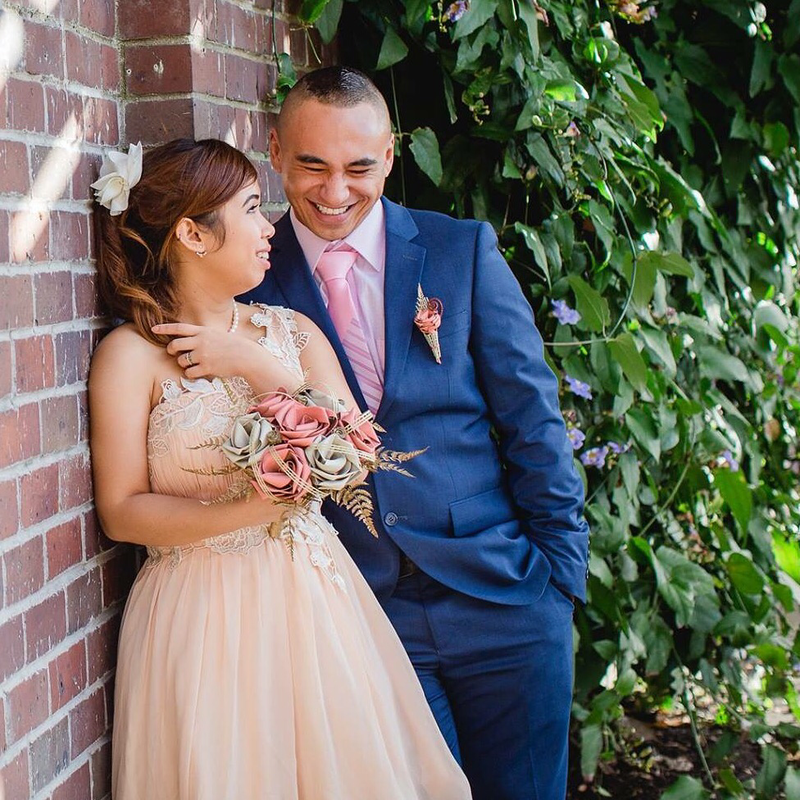 Our copper teardrop & koru corsages with gold fern & natural loops $25 NZD. 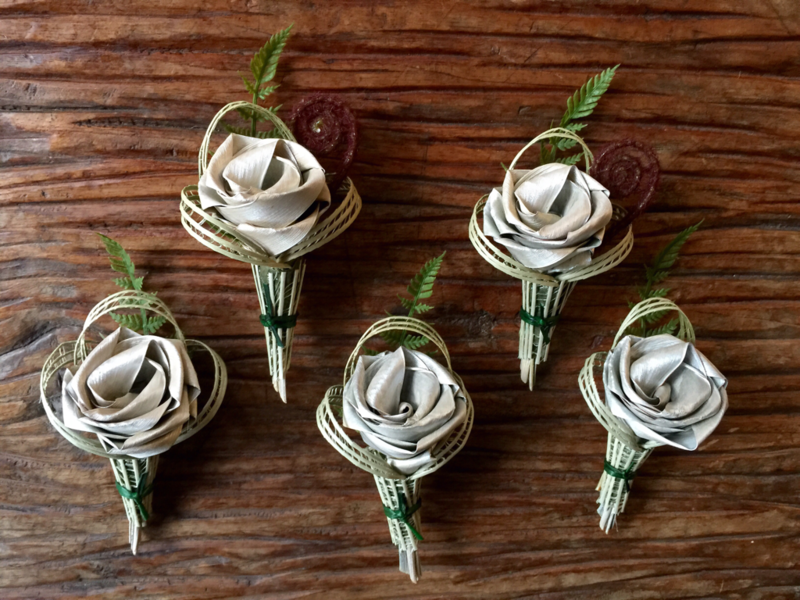 Native Koru buttonholes with imitation ferns & husk wrapped stalks $25 NZD each. 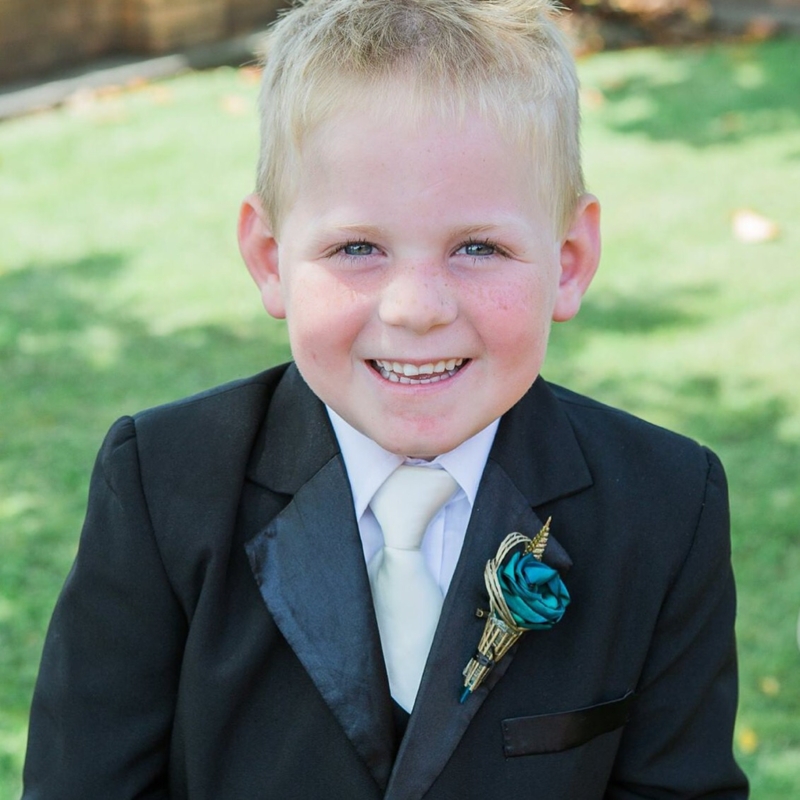 An excited pageboy wearing his mini buttonhole. Satin black ring pillow with a red woven flax band $50 NZD. 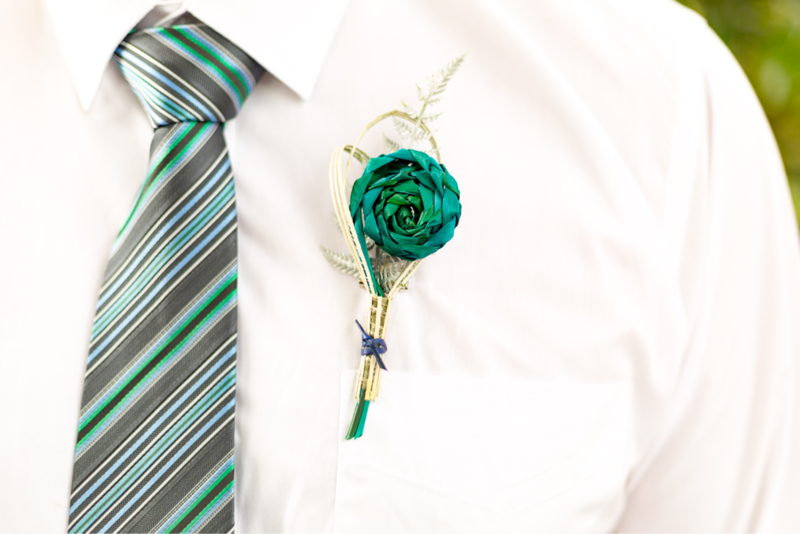 Grooms buttonhole with a rose, tiny bud & fan $25 NZD. 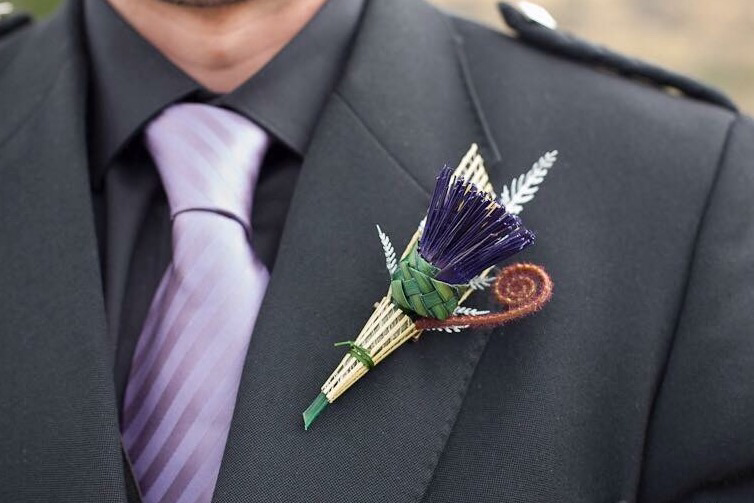 Thistle buttonhole with silver fern, koru and natural fan $25 NZD. 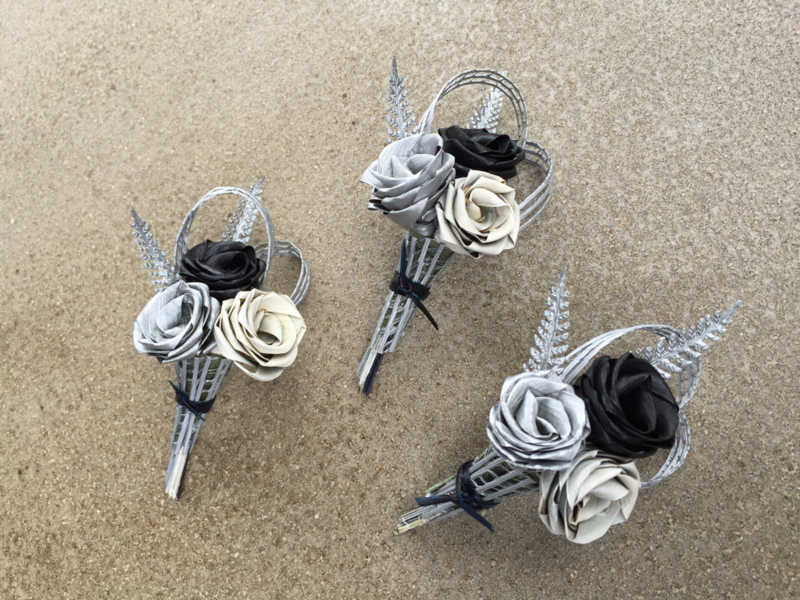 Three rose corsage in black, Ivory & silver with silver loops & ferns $25 NZD each. 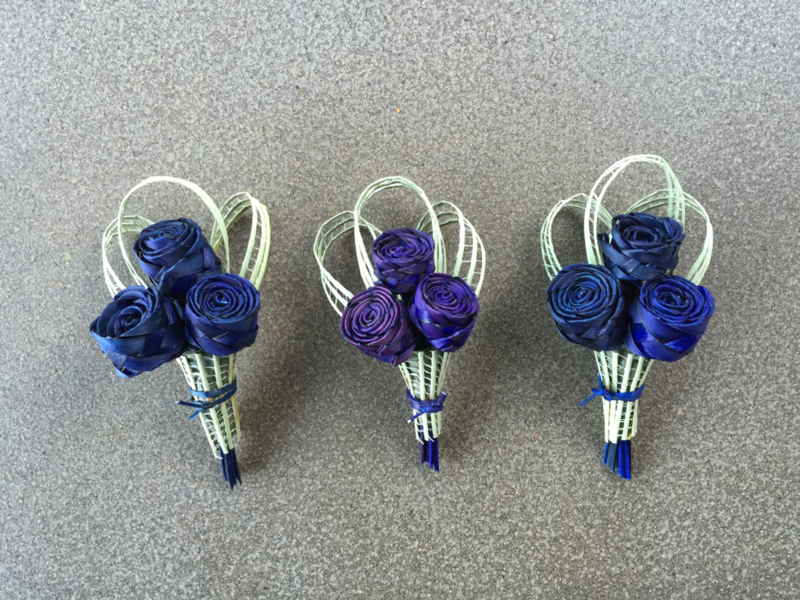 Three bud buttonholes in blue & purple with natural loops $25 NZD each. 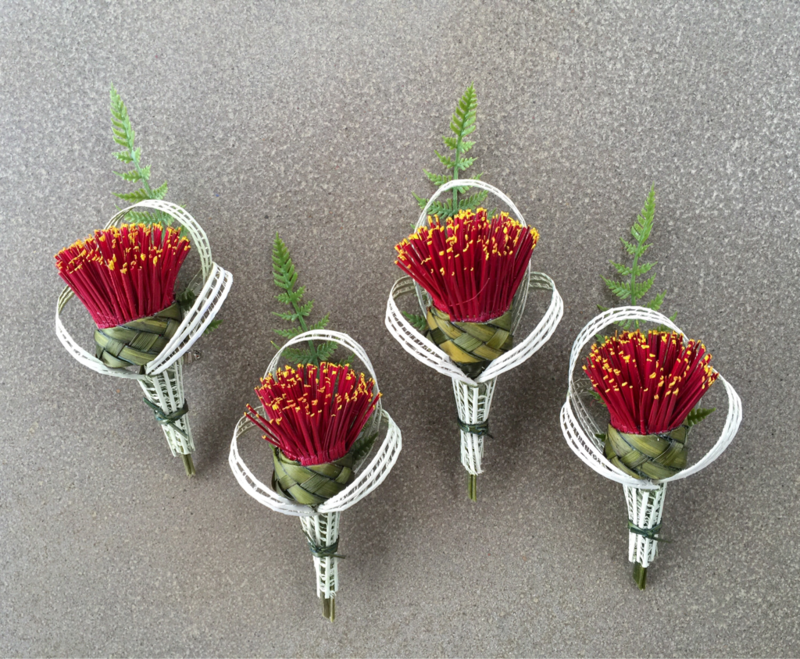 Pohutukawa buttonholes with green fern and white loops $25 NZD each. Woven koru buttonhole with natural loops and silver fern $25 NZD. 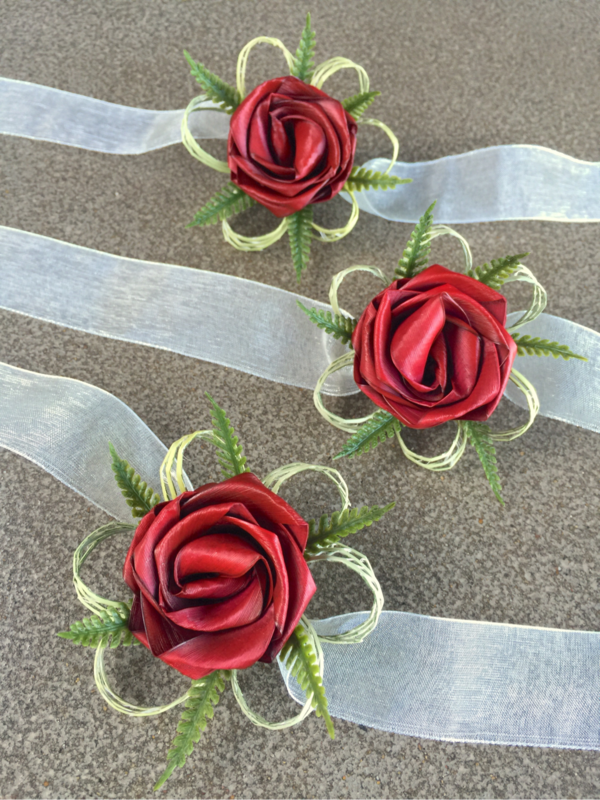 Wrist corsage with loops & organza ribbon $30 NZD. 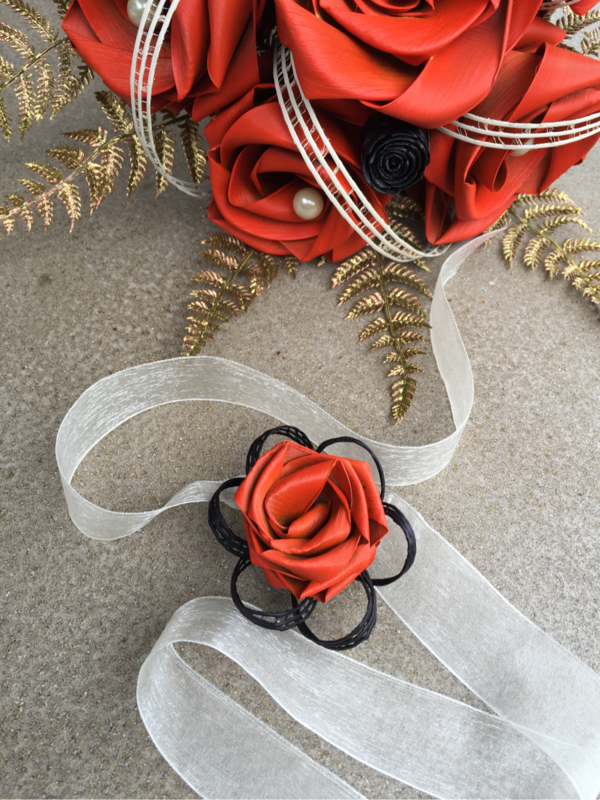 Wrist corsage in red with natural loops & tiny ferns $30.